Did you catch that? Holiday scenes. I’m being politically correct and accommodating to persons from all faith backgrounds. Ah, but screw it—this is Spain. Let’s call a spade a spade and a belén a belén: These are totally Christmastime photos, taken by me, an amateur who can barely operate a point-and-shoot camera. Enjoy!!!!!!!!!!!! 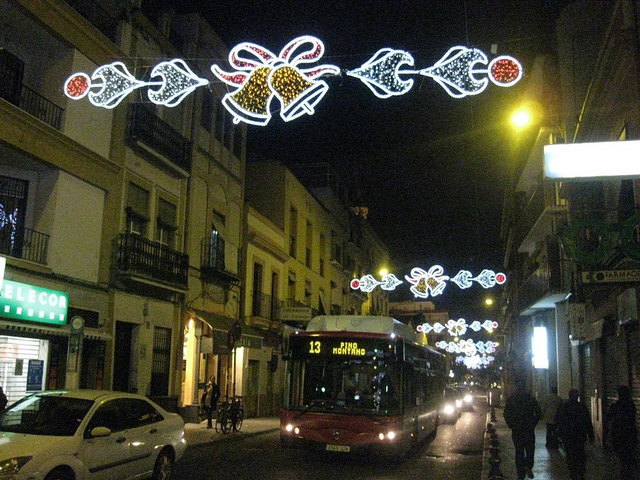 Lights along the Avenida de la Constitución, the main drag in Seville’s center, on which you’ll find the Cathedral. DO NOT GO HERE during peak hours (por las tardes, mostly) unless you’re a masochist who enjoys being suffocated in a rabid mass of humanity. 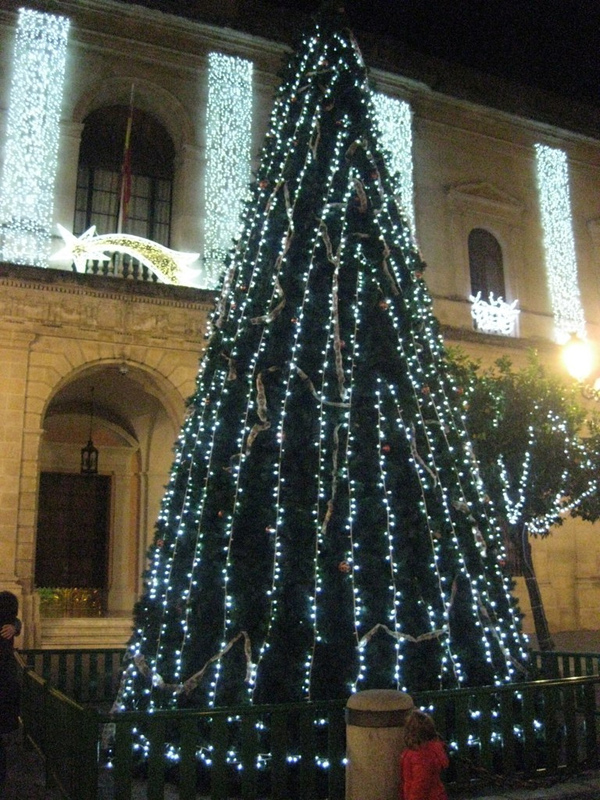 I took this photo from the front door to my building; Christmas lights along Calle Feria. And the 13 bus to Pino Montano, aka the bus I take to work, aka the greatest bus in the city. A terrifying Christmas-y street performer on Avenida de la Constitución. Is it supposed to be a donkey? Something to do with the Wise Men? It haunts me; I want no part of it. 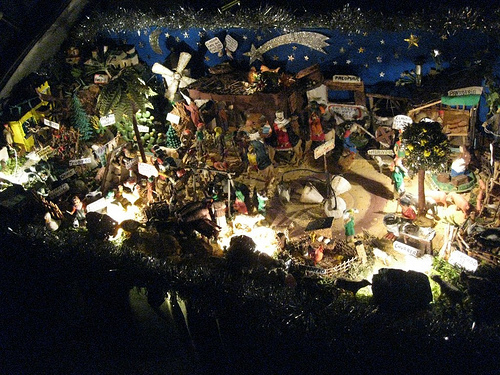 Yes, this is a nativity scene in the trunk of a car. The guy was set up at the end of San Jacinto near the Puente de Triana. How could anyone walk past this without stopping to admire? Eventually I threw a euro in his bucket because I felt like I had stared and taken too many pictures to just quietly walk away. He gave candy to all the little kids who gave him money, but not to me. I guess the fact that I look like a 40-year-old Norweigan woman didn’t work in my favor that night. See the rest of my mediocre but festive photos in all their full-size, high-resolution glory on flickr. Is that a goat? A gazelle? 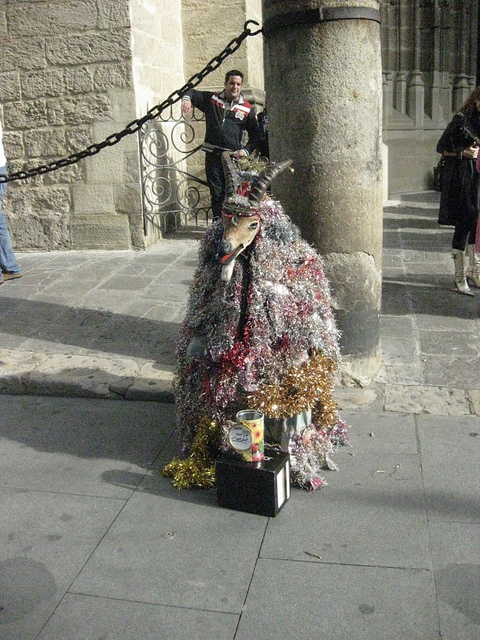 Those same sinister-looking, tinsel-clad donkeys migrate to Madrid at Christmas time, too! Also, that car trunk deservesmega holiday karma. ITS THE CHUPACABRA AND HE CLUCKS!!!! And I love that man on San Jacinto but have never dared to take a shot. 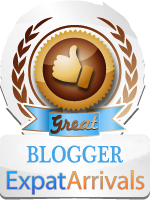 For a PaS, it’s great! Chupacabra? Gross. Now I dislike him even more. 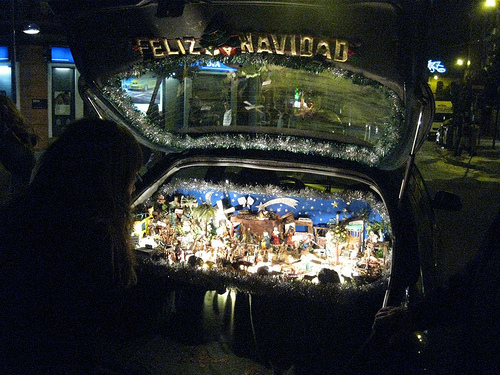 We featured the guy with the Nativity in the trunk in the second issue of más+menos, back in 2004. I have no idea about the goat guy. Christmas can certainly be spooky in some parts of the world! That’s great, I’ll have to look for the 2004 issue! Maybe you can feature the goat guy in a future más+menos… or maybe not. So pretty! I miss my Sevilla! I never saw the scary goat man though… how traumatic! And the car trunk belen just made my night. That is awesome! He must have a whole scary goat/chupacabra family, because one of his kin hangs out near the Plaza Mayor in Madird, too. p.s. you’ve changed your blog layout, im diggin’ all the primary colours. why yes I did change the layout, how observant of you! I actually just did it because the old one didn’t let me upload large photos… and you know, a photo isn’t worth sharing if it isn’t 20,000×20,0000 pixels. Considering you’re a self-proclaimed amateur there’s a whole bunch of great shots there! What the hell was that goat-christmas street performer playing at? Still beats the silver statues. At least he made an effort for the festive season! Keep shooting and you’ll go far. Just don’t get in the way of Christmas-goat man! I detest the silver statues. Almost as much as the guys who do the same thing but dress like plants—one of them suddenly moved and grabbed at me once when I was walking down the main drag here. I screamed bloody murder; it was as embarrassing as it was terrifying. And thanks for your kind words about the photos, I definitely plan to keep trying my hand at photography and continue posting whatever comes of it! I barely celebrate Christmas. I am not Christian. 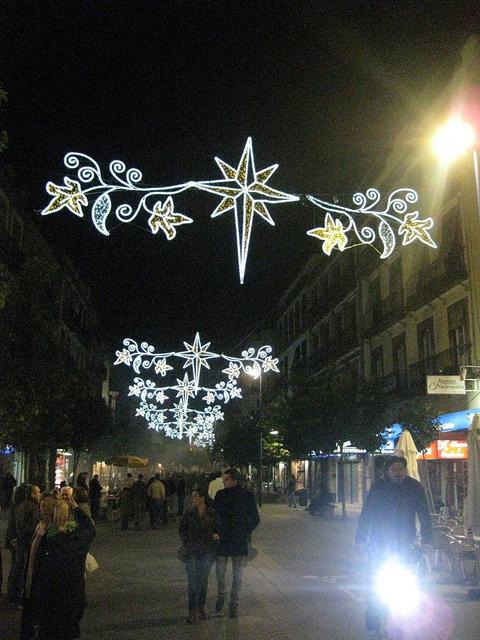 And, I swoon over the Christmas lights swaying over the streets in Spain. Thanks for the pics…can’t get enough of these Christmas lights. I think the Christmas lights are intoxicating for Christians and non-Christians alike. 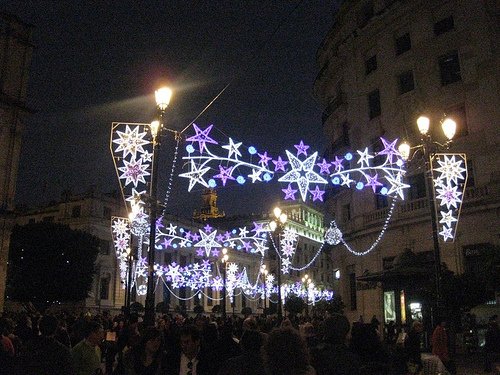 I can’t say I celebrate Christmas in any spiritual or religious way, but I, too, can’t get enough of the Christmas lights in Seville.